Hay alguien k me pueda decir donde puedo comprar los boletos para world series charreria, me urge saver gracias. Y FELIZ AÑO NUEVO A TODAS MIS COMPAÑERAS CHARRAS! ! Indomables do you ladies plan on federating this upcoming year? which new escaramuzas plan to federate next year? were very excited to see a lot of new ones joining us!!!! EDIT TO PREVIOUS MESSAGE!!! I put the wrong number, I am sooooooooooooooo sorry for any awkwardness I might've caused if someone was trying to reach me! My number is 210-875-6754. Again, I am so, so sorry! Quisiera saber si alguien sabe de alguna escaramuza en Laredo Texas si saben porfavor mandeme un mensaje a mariajose_cervantes@hotmail.com Gracias!!! 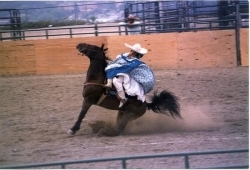 We are planning on making an escaramuza team based out of Helotes, Texas, and need girls to sign up! We want to focus on the beauty and excitement of escaramuza, not entirely upon the competition, although we do plan on competing. All in all, DRAMA FREE. So far, we have three or maybe four girls and an arena to work at. Boarding available at the location, right off of 1604 and Bandera Rd. If you need a horse, we have two who can possibly be trained for escaramuza with your hard work and dedication(Already broke to ride and safe, just need to be trained for escaramuza specifically). Please call or text me at 210-874-6754 God Bless! Hola somos un nuevo equipo en Lubbock, TX y queriamos saber en donde podemos comprar albardas, arreos, y botas para el equipo. Gracias! I need ideas para vestidos para escaramuza!! PLEASEEE! -Colors, designs anything! 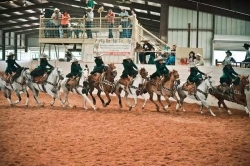 The Charros de Bejar have been asked to be in the Battle of Flowers and Stock Show Parade. Again. Last year we were number 1 in the equestrian section for the Battle of Flowers. We have also been approached to be in the Fiesta Flambo. Let us know if you are interested. The deadline to apply is early December. Estoy interesada en estar en un equipo en austin tx!! mi numero 5128035575 ! Puse el email equivocado. Este es el correcto.